Are you a user of Ledgeview’s CRM for Oil and Gas product? Join us on Friday, April 12, 2019, at 1:00 p.m. CDT for a NEW user group webinar all about how to optimize “Navigation, Leads, and Opportunities” with CRM for Oil and Gas. 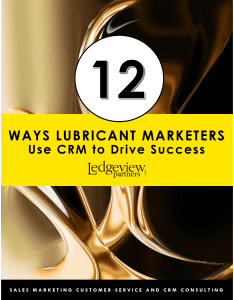 In this complimentary webinar, Steve Reybrock, a Senior Product Consultant and Managing Consultant at Ledgeview Partners with over 30 years of experience in the Oil and Gas industry, will conduct training on how you can improve your CRM skills and increase your efficiencies in these areas. Reybrock will also cover updates on the CRM for Oil and Gas enhancement roadmap, examine the top CRM challenges your CRM for Oil and Gas industry peers are facing and how to fix them, and answer user-submitted questions. Even if you can’t attend this time, we urge you to register anyway so you have no trouble receiving the link on-demand. Add “@LedgeviewPartners.com” to your Safe Senders List so you have no problems getting this email. If you want to learn even more about how leaders of the Oil and Gas Industry are using CRM to drive success, download the FREE expert eBook that unpacks the topic here.